Good Afternoon and Happy Monday! I hope everyone is having a lovely and productive start to the week. Today's "What's That Quote" showed up randomly on my feed over on Pinterest , probably due to all the searches I've done lately for some really awesome things to save for future posts. "Be a good person, but don't waste time to prove it." I have to be honest and say, I had never heard this exact quote. I have heard similar sayings, as in..."God knows your heart, you don't have to prove yourself to anyone else. "(Awesome, BTW!) and I thought I honestly believed and lived by that. I think I was wrong. I realize after reading this quote and trying to decide what it means to me and how I wanted to work it into a post, that it kind of...hit me. This one stung a bit. In my mind I am screaming, "I am a good person!" and "I do prove it!" Then, I thought...Why? Why am I always "proving it"? A good person to me is someone who gives without expectation of reward. Someone who is honest and respectful. Someone who likes to fulfill others needs. Someone who wants to give joy or happiness to others. Someone who wants to be a good person. Without the want or desire, how good can you be? I love to serve and help others. It's just a part of who I am. I love seeing joy and happiness on the faces of those I have served or helped. I like feeling that I have taken even a small burden from someone's day. And, I will continue to do that as long as possible. So, why do I catch myself going on and on about how much I accomplished in a typical day? Or all the great meals I have cooked? It may seem that I am boasting on myself. That is NOT the message I want to send. That is not what I am trying to teach my daughters! The message I am trying to say is that I am a good person. I do these things lovingly and with a giving heart. All that I do or try to accomplish are for a greater good. Not just to fill myself with pride. Even when it is something I don't want to do, I try to think of the positive outcome. It may not be what I want or would have done, but it may be for someone else. It may help them or bring them happiness. I know there have been several times throughout my own life where I have felt like nothing I did was good enough. I believe that has given me the idea that I have to repeat and maybe even boast on what I have done. To prove myself. Validation?? Yes, probably. I am human. I see that I have wasted time, my time, trying to prove myself. Honestly, with little or no gain from it. I owe no one any proof of how "good" I am. I will continue to strive to be good, better and give glory to God for my accomplishments and deeds done. I will continue to work on me and be good without proving it. I'm so far from perfect, but I am trying to be good! What does it mean to be a "good person" to you? 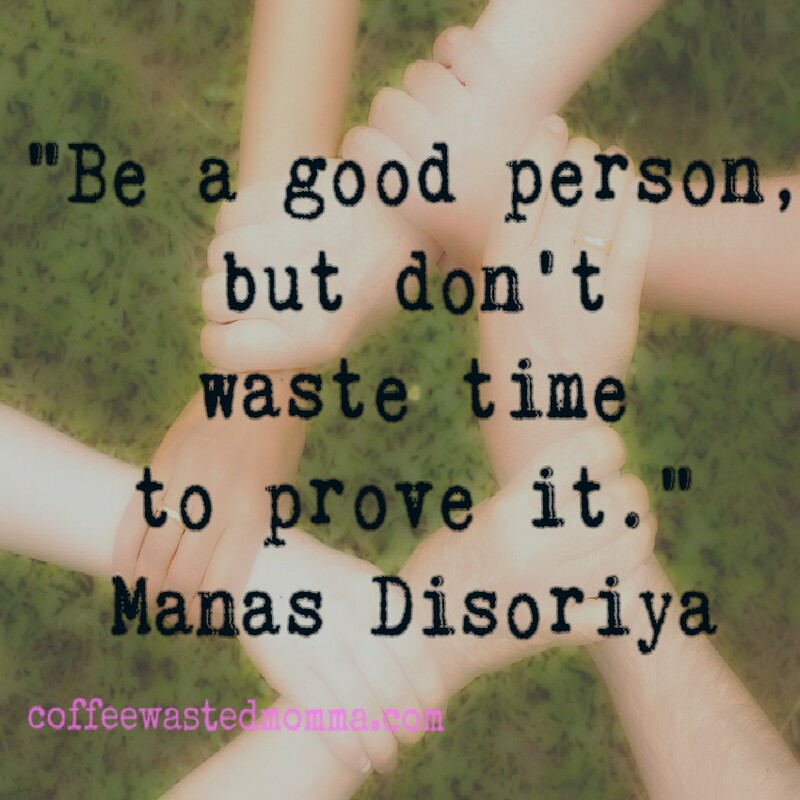 Do you find yourself wasting time trying to prove it? Labels: good peron, Manas Disoriya, What's that quote?